Oh and for the record, or at least to spark potential amusing comics, I like you better than debs. Leastways, you are slightly more tangential than she, and I like that. I imagine I would stop liking that were I ever to try working with you. Now, as you guys are fully aware, Debs is the favourite of the band, just like Davy Jones was the favourite. You know it, I know it. In fact, I decrease her popularity in FAWM! If you take a look at Debs profile, you will see her songs. Normally, doing a song with Debs is comment gold: everyone will want to comment on how amazing she is… and you get splashed with glory. ANYWAY, this is the reason for my celebration: someone appreciates the other person in the band. Even if it is conditional. I’m doing my part, no matter how little. 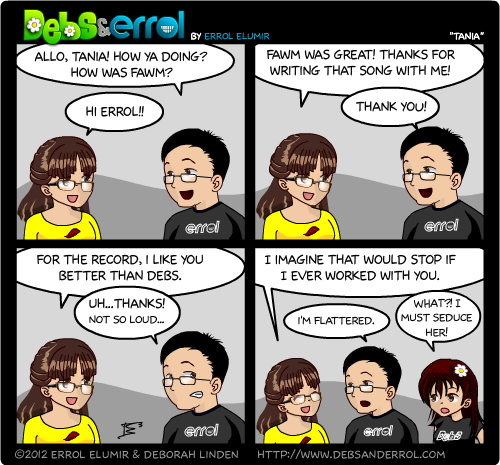 Tania: I GOT IN A DEBS AND ERROL COMIC!!! My life is now officially complete! Does her shirt have… bacon? 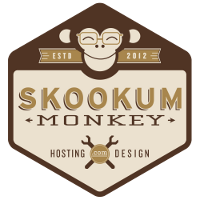 @Kelson, Hmmm… that would be awesome… but no… it’s a red wing. @Errol, is she from Detroit? That would be extremely… disappointing. Also, bacon is good. Now I’m sad I have no bacon. How did I not comment on Debs’ seduction comment? It’s soooooooo Errol writing for Debs and maybe a chance of her actually thinking that. EEEEEEEEE I’m in a comic!!! Oh, and nope, sorry, i’m all British!